Salt Lake City is the capital and largest city in Utah. 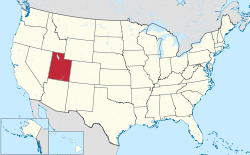 Utah is a state located in the Western United States. As of 2010[update], there are 243 incorporated municipalities in the U.S. state of Utah. A municipality is called a town if the population is under 1,000 people, and a city if the population is over 1,000 people. Incorporation means that a municipal charter has been adopted by the affected population following a referendum. In the Constitution of Utah, cities and towns are granted "the authority to exercise all powers relating to municipal affairs, and to adopt and enforce within its limits, local police, sanitary and similar regulations not in conflict with the general law.". They also have the power to raise and collect taxes, to provide and maintain local public services, acquire by eminent domain any property needed to make local improvements, and to raise money by bonds. On July 22, 1847, the first party of Mormon pioneers arrived in the Salt Lake Valley, where they founded Salt Lake City, the first European settlement in Utah. Over the next 22 years, more than 70,000 pioneers crossed the plains and settled in Utah. Initial colonization along the Wasatch Front was mostly made by members of The Church of Jesus Christ of Latter-day Saints (LDS Church) with no direct involvement from it. Outside the Wasatch Front, most settlements were directed, planned, organized, and dispatched by leaders of the LDS Church. Settlements were also founded by the railroads, mining companies and non-Mormons. Many settlements were named after leaders, history or from scriptures of the LDS Church. Natural features of the region, including rivers, mountains, lakes and flora, are also commonly used for names. The 2010 U.S. Census count puts 2,438,347 of the state's 2,763,885 residents within these cities and towns, accounting for 88.2% of the population. Just over 75% of Utah's population is concentrated in the four Wasatch Front counties of Salt Lake, Utah, Davis, and Weber. The largest city is the state's capital of Salt Lake City with a population of 186,440, and the former coal mining town of Scofield is the smallest town with 24 people. and * symbol indicates that this city or town is the county seat of its respective county. Castle Dale* Emery 1,630 2.16 sq mi (5.6 km2) 5,676 feet (1,730 m) 1879 $44,185 Located in the Castle Valley, but a Postal Service mistake listed town as Castle Dale instead of Castle Vale. Clarkston Cache 666 0.97 sq mi (2.5 km2) 4,879 feet (1,487 m) 1864 $40,592 Justus Clark, an original settler. Ephraim Sanpete 6,135 3.73 sq mi (9.7 km2) 5,541 feet (1,689 m) 1854 $28,318 Tribe of Ephraim, one of the twelve Tribes of Israel. Farr West Weber 5,928 6.04 sq mi (15.6 km2) 4,265 feet (1,300 m) 1858 $41,618 Located west of Farr's Fort which was named after Lorin Farr, an early LDS Church stake president of the area. Hyrum Cache 7,609 4.84 sq mi (12.5 km2) 4,698 feet (1,432 m) 1860 $43,981 Hyrum Smith, brother to Joseph Smith, founder of the Latter Day Saint movement. Magna Salt Lake 26,505 7.4 sq mi (19 km2) 4,278 feet (1,304 m) 1868 “Magna” comes from the Latin word meaning “great” or “superior"
Moab* Grand 5,046 4.13 sq mi (10.7 km2) 4,026 feet (1,227 m) 1855 $32,620 The Biblical name Moab or the Native American word for mosquito was "Moapa"
Panguitch* Garfield 1,520 2.14 sq mi (5.5 km2) 6,624 feet (2,019 m) 1866 $33,500 A Native American name for nearby Panguitch Lake meaning "water" and "fish"
Paragonah Iron 488 0.64 sq mi (1.7 km2) 5,879 feet (1,792 m) 1851 $33,958 Native American name for the nearby Little Salt Lake that means "marshland"
Parowan* Iron 2,790 6.66 sq mi (17.2 km2) 6,017 feet (1,834 m) 1851 $32,426 From the Native American words paragoons and pahoan, meaning "marsh people"
^ a b c d e f g h i j Apple Valley, Bryce Canyon City, Central Valley, Cottonwood Heights, Daniel, Hideout, and Independence were incorporated after the 2000 Census; therefore, these city or town's area and median household income are not reported by the Census Bureau. ^ a b c d Sources are unsure how Levan, Lynndyl, Marysvale, and Mona received their names. ^ a b c d "Population and Housing Occupancy Status: 2010 - State -- Place". United States Census Bureau. 2010. Archived from the original on July 21, 2011. Retrieved January 7, 2012. ^ "Utah Code, Title 10, Chapter 2, Section 301". Utah State Legislature. Retrieved January 5, 2017. ^ a b "Utah Constitution, Article XI, Section 5". Utah State Legislature. Archived from the original on March 3, 2012. Retrieved May 11, 2010. ^ Slaughter, William W.; Landon, Michael (1997). Trail of Hope – The Story of the Mormon Trail. Salt Lake City: Shadow Mountain. ISBN 1-57345-251-3. ^ "2010 Census U.S. Gazetteer Files for Places". United States Census Bureau. June 10, 2011. Archived from the original on December 29, 2011. Retrieved January 8, 2012. ^ "US Board on Geographic Names". United States Geological Survey. October 25, 2007. Retrieved May 11, 2010. ^ a b Van Cott, John W (1990). Utah Place Names. Salt Lake City: University of Utah Press. ISBN 978-0-87480-345-7. ^ "Census 2000 Summary File 3 (SF 3)". United States Census Bureau. Retrieved May 11, 2010. ^ "About Us". Big Water City. Archived from the original on January 20, 2012. Retrieved May 9, 2010. ^ Jenson, Andrew (1919). "Origin of Western Geographic Names". The Utah Genealogical and Historical Magazine. The Genealogical Society of Utah. 10: 42. Retrieved August 1, 2010. ^ "Facts and Figures". Town of Castle Valley. Retrieved May 9, 2010. ^ a b "Early History". Centerville City. Archived from the original on October 20, 2007. Retrieved May 10, 2010. ^ "Elmo Town". www.emerycounty.com. Retrieved 2019-04-17. ^ "Emery City". Emery County. Retrieved May 10, 2010. ^ "Ferron City History". Ferron City. Retrieved May 10, 2010. ^ "History". Fruit Heights City. Archived from the original on November 26, 2013. Retrieved May 10, 2010. ^ "About Us". Garden City. Retrieved May 10, 2010. ^ Jenson, Andrew (1919). "Origin of Western Geographic Names". The Utah Genealogical and Historical Magazine. The Genealogical Society of Utah. 10: 182. Retrieved August 1, 2010. ^ Jenson, Andrew (1919). "Origin of Western Geographic Names". The Utah Genealogical and Historical Magazine. The Genealogical Society of Utah. 10: 186. Retrieved August 1, 2010. ^ "History". Highland City. Archived from the original on January 3, 2010. Retrieved May 10, 2010. ^ "History of Huntington". Utah Encyclopedia. University of Utah. Archived from the original on March 4, 2012. Retrieved May 10, 2010. ^ "Huntsville Town Founding history". Town of Huntville. Retrieved May 10, 2010. ^ "Hurricane". Utah History Encyclopedia. University of Utah. Archived from the original on April 25, 2012. Retrieved May 10, 2010. ^ "Ivins City History". Ivins City. Retrieved May 10, 2010. ^ Jenson, Andrew (1920). "Origin of Western Geographic Names". The Utah Genealogical and Historical Magazine. The Genealogical Society of Utah. 11: 84. Retrieved August 1, 2010. ^ Jensen, Andrew (1941). Encyclopedic History of the Church. University of Wisconsin. p. 488. OCLC 3188924. ^ Jenson, Andrew (1920). "Origin of Western Geographic Names". The Utah Genealogical and Historical Magazine. The Genealogical Society of Utah. 11: 88. Retrieved August 1, 2010. ^ "Birth of Myton". City of Myton. Retrieved August 1, 2010. ^ "Brief history of Nibley". Nibley City. Archived from the original on January 11, 2011. Retrieved August 1, 2010. ^ Jenson, Andrew (1920). "Origin of Western Geographic Names". The Utah Genealogical and Historical Magazine. The Genealogical Society of Utah. 11: 176. Retrieved August 1, 2010. ^ Jenson, Andrew (1921). "Origin of Western Geographic Names". The Utah Genealogical and Historical Magazine. The Genealogical Society of Utah. 12: 42. ^ "History of Riverdale". City of Riverdale. Retrieved May 11, 2010. ^ Jenson, Andrew (1921). "Origin of Western Geographic Names". The Utah Genealogical and Historical Magazine. The Genealogical Society of Utah. 12: 43. ^ Jenson, Andrew (1921). "Origin of Western Geographic Names". The Utah Genealogical and Historical Magazine. The Genealogical Society of Utah. 12: 46. ^ Jenson, Andrew (1921). "Origin of Western Geographic Names". The Utah Genealogical and Historical Magazine. The Genealogical Society of Utah. 12: 126. ^ Jenson, Andrew (1922). "Origin of Western Geographic Names". The Utah Genealogical and Historical Magazine. The Genealogical Society of Utah. 13: 38. Retrieved August 1, 2010. ^ Doelling, H. H. (1972). Central Utah coal fields: Sevier-Sanpete, Wasatch Plateau, Book Cliffs and Emery. Salt Lake City: University of Utah. p. 3. ISBN 978-1-55791-002-8. Retrieved August 1, 2010. ^ Jenson, Andrew (1922). "Origin of Western Geographic Names". The Utah genealogical and historical magazine. The Genealogical Society of Utah. 13: 39. Retrieved August 1, 2010.